Are you further along in your pregnancy? Are you finding it hard to sleep? You probably expected to lose sleep after your baby arrives, but likely you had no idea that sleep would be so hard to come by in these final months of pregnancy. If you’re desperate for comfortable rest, read on. Many women have found that a pregnancy pillow provides them with the perfect amount of support in just the right places, allowing them the comfort they need to settle into a peaceful slumber. Here’s everything you need to know to find the right one for your body. Use the links above to check the latest prices or read our in-depth pregnancy pillow reviews below. 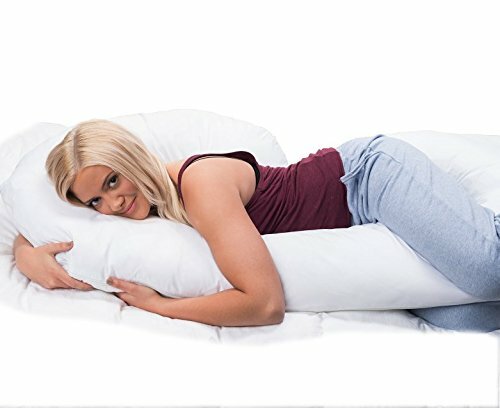 Do I Need a Pregnancy Pillow? Can I Use a Regular Pillow? 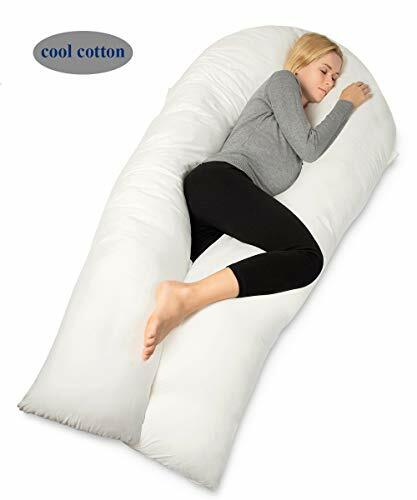 A pregnancy pillow is a large, specially-engineered pillow designed to cradle your pregnant body to facilitate better comfort and better sleep. It offers you support in places to prevent muscle strain, and helps to reduce pressure points. As amazing as it is, growing a baby puts an incredible amount of stress on your body. Even in your most relaxed position, you can still feel incredible discomfort, making sleep difficult. It doesn’t help that, when you’re pregnant, you are limited in the number of sleep positions you can enjoy. You can no longer sleep on your stomach due to your bulging belly, nor can you sleep on your back as your uterus will put pressure on the vena cava, a major blood vessel (source). Even side sleepers are afflicted with limited sleep positions while pregnant, since the recommendation is generally to sleep on your left side to maximize blood flow to your baby (source). Sleeping in one position for a long period creates pressure points that cause significant discomfort in a non-pregnant person. Hip pain: Your body produces the pregnancy hormone relaxin to prepare your pelvic joint for opening during the birthing process. Unfortunately, it also makes your other joints loose as well. When you’re sleeping on your side, your knees are pulled together, hyperextending your upper hip and causing pain. Lower back pain: Lower back pain can be excruciating during pregnancy, and sometimes even laying down doesn’t ease it. The reason for this is similar to the cause of hip pain — relaxin causes your joints to loosen, and the knees and hips tug at other ligaments as they are pulled down. Round ligament pain: Round ligament pain is a sudden, sharp sensation felt along the lower part of your abdomen and happens as a result of extreme stretching. This pain is often triggered by movements like rolling over in bed. Pelvic joint pain: As your joints begin to relax, you may begin to feel discomfort in your pelvic joint. Extreme, shooting pains are called pubis symphysis dysfunction. Your pelvic pain may feel like a constant ache, while your pubis symphysis dysfunction will probably only be noticeable when you engage in a movement that separates the legs, like rolling over in bed. Heartburn: Heartburn is a common pregnancy affliction thanks to the increased crowding of the abdominal cavity, and because the valve between the stomach and esophagus relaxes (source). When you lie flat, it can cause stomach acids to enter the esophagus more easily, causing heartburn and making it even worse when sleeping. Shortness of breath: The further along you get in your pregnancy, the more pressure your growing baby puts on your diaphragm (source). This can make it difficult to take a full breath. Inability to move: When you’re not pregnant, it’s easy to shift your body position as needed without ever fully waking, keeping your body comfortable and allowing you to enjoy uninterrupted slumber. When you’re pregnant, shifting your body position is a much bigger task that requires you to be more fully awake — and even enlist the help of your partner. Instead of moving naturally in your sleep whenever you feel uncomfortable, you wake up regularly to roll over and interrupt your slumber. When considering a pregnancy pillow, there are several different types to choose from. A wedge pillow is a tapered piece of foam most frequently used under your belly to offer support, so its weight doesn’t pull it down toward the mattress, allowing you to sleep on your side more comfortably. A wedge pillow can also be used on your back to prevent you from rolling over if you’re prone to back sleeping, or under your head pillow to elevate your upper body. Even after your pregnancy, you might find yourself using your wedge pillow to prop up your upper body when you have a cold. Because it is designed to be a supportive piece rather than a standalone pillow, it is usually made of much firmer material than traditional pillows. It takes up less room in your bed. It is portable for travel. It does not provide full-body support. You may need additional pillows. The severity of the wedge varies by brand — it is not adjustable. To use a pregnancy wedge pillow, simply place it under your belly to offer support while you’re sleeping. You may also use it under your pillow to elevate your torso if you have trouble with heartburn or shortness of breath. Body pillows have gained popularity throughout the general population — not just during pregnancy — thanks to how they help increase your comfort. These look like extra-long regular pillows and offer support from your head to your knees. You may or may not choose to use a regular pillow in addition to your body pillow, though it depends on your specific sleeping position. It does not take up a lot of space. It is a more inexpensive option. It is versatile for use post-pregnancy. It does not offer back support. It does not offer under-belly support. To use a straight pillow, place it along your side and snuggle up against it — much like you would if you were snuggling with your partner. Most women find it comfortable to place their top knee over the pillow to keep their hips parallel. A flexible pillow functions much like a straight body pillow, except it is designed to be more adjustable for your comfort. Because of this, the fill is often different than a regular pillow and it could make noise when you shift at night. Snuggle against your flexible pillow much like you would your partner. Tilt the top in to function as a regular pillow for your head, and bend the bottom between your knees to keep your hips parallel. It is flexible so you can customize your comfort. It does not take up as much room in the bed as other pillows. You may not need any other support. It could be noisy due to the filler. Some pillows are shaped like the letter “C” and can completely replace your need for any other supportive pillows. One end cradles your head, runs down along your back and then between your knees to keep your hips parallel. It is designed specifically for pregnancy comfort. You do not need to use a regular pillow. It may cause you to feel hot. A U-shaped pillow resembles two full-length body pillows that are connected in the middle. They offer support along both your front and back, keeping you in position and cradling your body wherever you need it. It also offers support for your head and neck, and between your knees. While it offers the maximum support, it may be more than some women need. It can help you achieve maximum comfort. You do not need a regular pillow. It can insulate you and make you hot. It is a single-use item — not practical for use when you’re not pregnant. To use a u-shaped pillow, place the bottom of the “U” between your knees to keep your hips parallel. One side of the “U” will run up your body along your back, while the other end will run along your front. Use the top of the portion that runs along the front to cradle your head. Or, you can use the bottom of the “U” in place of your regular pillow and allow each side to run parallel to your body. You could then snuggle up against one side and place your knee on top of it to provide support. An inflatable pregnancy pillow is designed for the die-hard stomach sleeper. It resembles a single-sized blow-up air mattress or pool float, but with a hole in the middle to accommodate your belly. It can be used for sleeping flat on your belly, or just for the side sleeper who tends to lean toward their stomach, putting pressure on their belly. It also helps to relieve pressure on your legs and back. It allows a stomach sleeping position while pregnant. It helps relieve back and leg pain. It cannot be used in bed. It doesn’t keep the hips parallel for side sleepers. It may not work well for women with a long torso. What are your primary physical complaints? Do you struggle to get comfortable in general, or do you need your stomach and knees propped up? Choose a pregnancy pillow that will help meet your specific needs — don’t just pick the one your bestie chose because it was right for her body. If you’re not sure exactly what will help, try to prop several pillows at different pressure points on your body. See what feels best, and opt for a pregnancy pillow that will mimic your collection. Pregnancy pillows are made of different types of material. Styrofoam beads similar to a bean bag chair. Shredded foam or memory foam. They all have different qualities they bring to the table. Memory foam holds its shape, but can be hot. Regular pillow fill is affordable, but may compress over time. Styrofoam beads are inexpensive, but make noise when they shift. Microbeads are quiet, but don’t rebound quite like a regular pillow. Choose the material that best meets your needs and offers the right support to you. Some pillows are very bulky. If you plan to continue sleeping in a bed with your spouse, then take the size of your bed into consideration. If you’ve got a California King, you can probably pick from the whole list of options. But if you’re snuggled up in a full, you might need to choose something more compact. Pregnancy pillows come in varying lengths. If you’ve got a long torso or are exceptionally tall, consider that if you’re picking something you hope will support both your head and your knees. Depending on the size of your pillow, you may or may not be able to pop it in your washing machine. But you definitely want to be able to wash the cover. Since pregnancy pillows come in unique shapes and sizes, you’re not going to be able just to buy a new cover off the shelf. So unless you’ve got some mad sewing skills, make sure the pillow you choose has a removable cover that can go in the washing machine. Here are ten of the best products currently on the market to help you sleep more comfortably during pregnancy. When you’re pregnant, the best place to sleep is on your side -- your left side, to be exact. If you’re already a fan of this sleeping position, you need a pregnancy pillow that will keep your back, belly, and hips as comfortable as possible. You don’t want any more heat-trapping insulation than you already have when you’re pregnant. If you’re a seasoned side-sleeper, you probably won’t need the additional pillow support in the back to keep you from rolling over, so this straight body pillow should do the trick. At 54 inches long, it will fit most women from their head to their knees. Though it’s made with memory foam so it won’t go flat, it also has cooling technology to help you from overheating. And since it’s not exceptionally bulky, you may find you love it so much you continue to use if after pregnancy, too. Unlike many memory foam products, this is fully machine washable. And though it comes with a removable cover for separate washing, since it’s a standard, though oversized, pillow shape, you can probably find additional covers that will fit it to match the decor in your bedroom. The pillow is made with Certi-PUR foam, which means they limit harmful emissions during the production process, and also lack many harmful irritants. Plus, they are hypoallergenic and dust mite resistant, making them an excellent choice for anyone with sensitivities or allergies. What makes this pillow even better is that it comes with a 100-night sleep guarantee. If you’re not satisfied for any reason, you can return the pillow and get a full refund — no questions asked. It will not cause you to overheat. It is not designed specifically for pregnancy. It is not as flexible as some other options. Wedges are a great multi-use pregnancy sleep solution. They can go under your belly, between your knees, behind your back, or under your pillow. To choose the right one for you, you’ll need to evaluate the exact complaint you’re struggling with, and choose a wedge with the proper grade to help you get comfortable. A wedge is a fantastic pregnancy pillow option to get the support you need without all the bulk and heat-trapping insulation. This pregnancy wedge pillow is 2-sided and made of foam with different densities, meaning in this one product you can find the support that best fits your needs. 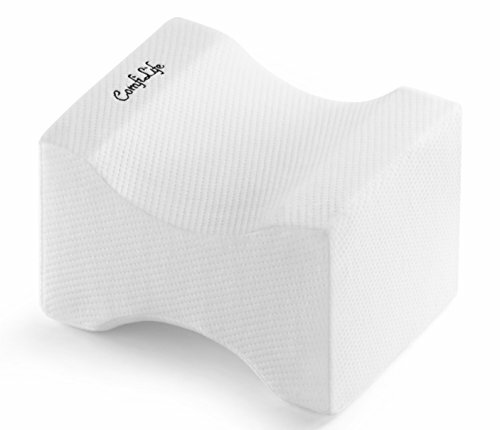 This is different from other wedge pillows which are one-size-fits-all and don’t have differing levels of support. The wedge shape also allows you to put it as far under your belly as you need, unlike other pregnancy pillows which have a one-size-fits-all place to support your bump. The foam has a ventilating layer to promote air flow, helping to keep you cool during the night. And the removable cover is made of a super-soft plush velboa, making it incredibly comfortable. The grade of the slope is not super steep, so it offers gentle support under your belly, behind your back, or between your knees. However, it may not be ideal for knee and hip support — if this is your primary issue, you may want to consider another product designed specifically for that purpose. Because it is compact, it is convenient for traveling — in fact, it even comes with its own travel case. It also takes up less space in your bed, helping to ease some of your major discomforts without the bulk of a full-size body or pregnancy pillow. It is cooler than a full-size pillow. It has different firmness on either side. It is not ideal for use between the knees. The foam does not appear to be machine washable. Back pain is a common complaint during pregnancy, and relief can come one of two ways -- by keeping the knees in alignment or propping up the belly if it’s dragging you down. Body pillows that run along your back can also give you a sense of relief, too. This deluxe pillow is designed to cradle your whole body so you can enjoy support exactly where you need it. Its U-shaped design provides support for your head, neck, belly, knees, hips, and all along your back. While primarily intended for sleeping, this pillow is also versatile and can be used to comfortably prop yourself up and read in bed, recline while watching television, or elevate your baby while nursing. It can be enjoyed even when you’re not pregnant, but since it was designed specifically with your baby bump in mind, there is support for your belly. It is made of natural materials, with cotton filling and a removable, washable cotton cover. Cotton tends to be more breathable than materials like foam, so it may be less likely to make you overheat than other pillows. They do not specify whether the pillow itself can be washed, though if it can you will likely need a large-capacity washer due to its size. Even though it is a unique size and shape, replacement covers are available for purchase in the event yours gets too worn. The pillow comes with additional tips on how to maximize the support, and it also comes with a money-back guarantee. If you’re not happy, you can request a refund within the first 30 days. It is made of cotton. It may not be machine washable. It may compress over time. Pregnant women come in all different shapes and sizes, and thankfully so do pregnancy pillows. If you’re a plus-size woman, you may want to avoid the U-shaped pillows as they may not fit as well. Instead, opt for a full-body pillow, a C-shaped pillow, or a wedge. 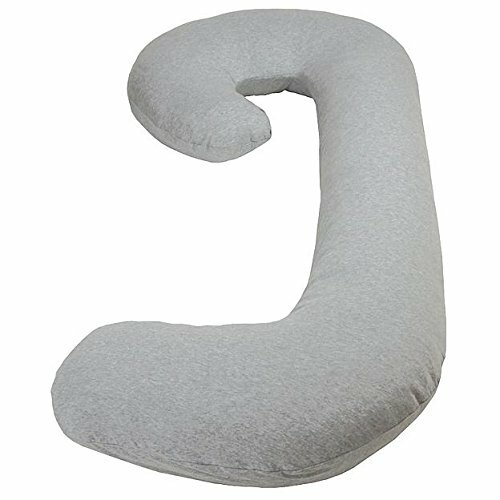 This uniquely-shaped pillow combines the flexibility of a C-shaped pillow with the customization of a flexible pregnancy pillow. The top can be used to either cradle your head or incline your torso if used underneath a traditional pillow. The bottom curve allows you to prop your knees up and keep your hips in alignment. The long edge can run along your back and offer extra support, or you can use it to prop up your belly and snuggle up against it. Because it is open-ended on one side, it will accommodate a number of different body types. It has a removable, washable cover that is made of a jersey knit material for extra softness. It is filled with regular, fluffy pillow filler that makes it very comfy, but may compress over time. But it is also machine washable like a regular pillow for occasional deep cleaning. It is suitable for all body types. It offers more support than a regular body pillow. It is designed for pregnancy. It may add extra heat. We get it -- you don’t want to spend a ton on a pillow you’re only going to use for a few months. Typically, your cheapest option will be to buy a simple wedge. But if you’re looking for full-body support, you’re most likely to find affordability based on the filler you choose. Is it possible to get quality and affordability? With this pregnancy pillow, you don’t have to compromise. The C shape offers you the same custom support as some of the more expensive pillows on the market, and you don’t even have to worry about sensitivities since it is crafted with hypoallergenic materials. It is made of 100 percent polyester. This pillow is completely machine washable if you have a large enough washing machine. If you don’t, there is a removable cover that can be washed instead. The pillow is 56 inches in length so it will work for women of any stature. And since it’s just over two feet wide, it won’t take up the whole bed — leaving plenty of room for your partner. It is versatile, meaning you can use it to position yourself for more than just nighttime sleeping and you may even find it useful during the postpartum period. Down the road, you may want to get it out of storage if you start to develop back or hip pain. Your husband just might steal it from you if he suffers from the same afflictions. Unfortunately, there are no additional covers that can be purchased to customize the look of your pillow. It is made of polyester — not natural materials. The filler may compress over time. You cannot purchase decorative covers. If you’ve got hip pain, you need a pregnancy pillow that will go between your knees to keep your hips parallel. It also needs to be quite firm to keep from compressing throughout the night and dragging your hips down with it. If hip pain is your primary complaint, you may not need a full-size pillow to add extra bulk and heat to your bed. A single pillow between your knees to keep your hips parallel may do the trick. This ergonomic pillow is designed to do just that, keeping your knees, hips, and spine in proper alignment. It also helps to improve leg circulation. It is made out of firm, high-density memory foam so it won’t flatten over time and will offer long-term support while sleeping. The zippered outer cover makes cleaning a breeze, and its small design makes it easy to take along if you’re traveling. One drawback, however, is it is not clear whether this pillow itself is machine washable. Since it is essentially a foam block, it is not likely machine washing is advised — except for just the cover. And since it’s ergonomically designed to be used between the knees, it’s not practical to use as a support pillow on other parts of your body. It has a zipper outer cover. It does not offer full-body support. It is a single-use item. It cannot be machine washed. Body pillows are gaining in popularity, and for a good reason. Even non-pregnant women need to keep their body in proper alignment, so opting for one while you’re expecting is also an investment in your long-term slumber. This versatile pillow provides total customizable support for any body — pregnant or not. It is designed to wrap completely around your body, and is moldable enough to help you form it into the proper shape and position to keep you comfortable. It is designed to keep your neck, shoulders, spine, and pelvis in alignment to minimize neck, back, and hip pain. The filling is made of synthetic down which means it is also hypoallergenic and odorless. It is completely machine washable, though it may be difficult to wash it at home depending on the size of your washing machine. For more frequent washing, you can remove the zippered outer cover and wash it instead. The filling was designed to maximize air flow to help keep you from overheating, and will hold its shape over time and not clump like some other pillow fillers. The pillow is a whopping 10 pounds, which is a testament to both its heft and functionality. But that may also mean it’s difficult for you to move from room to room, and that it would be too bulky for use post-baby if you want to continue sleeping in the same bed as your partner. This pillow was made in the U.S., and the fabric and materials were also domestically sourced. It is made in the U.S.
You probably never guessed being tall would affect your selection of pillows, but it does when you’re shopping for a pregnancy pillow. You’ll need one that is designed specifically for a long torso. Otherwise, opt for a combo of a full-body pillow and wedge between the knees to give you the comfort you crave. This pillow is designed for both pregnant and non-pregnant use. That means it doesn’t have specific cutouts to accommodate your belly, but since it is both large and flexible, you can adjust it to provide the support exactly where you need it. 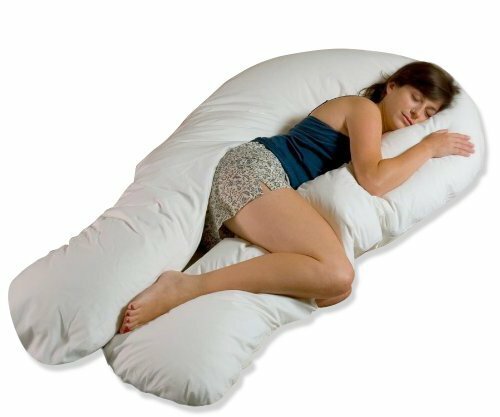 This particular pillow is extra long — over five feet in length on either side — so it’s ideal for a tall woman or someone with a long torso. 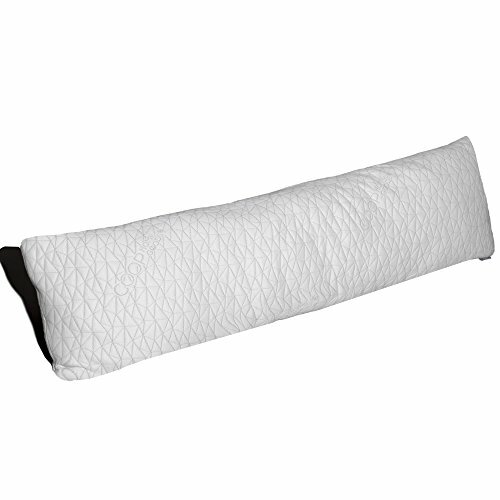 The filling is a high-density Bionic Polyethylene which offers the support of traditional pillow filler. It is hypoallergenic and does not emit a scent. Because it is soft filler, it is silent when you shift at night and will not disturb you. While the pillow itself is not designed to be washed, it does come with a removable cover that can be. The pillow is about seven pounds, and its bulk and weight contribute to its ability to support your growing body in just the right places. However, because of its size, it will be difficult to take with you if you travel during your pregnancy. It does not make noise when shifting. If you’re petite, what works for your tall friend probably won’t work for you. If you can’t find a pregnancy pillow that will match your shorter stature, choose a flexible full-body pillow you can bend and mold into the perfect “U” or “C” shape. Though this pillow was initially designed for use during pregnancy, it can offer support and comfort to any person. This can help you get long-term use out of an item that initially seems to only be useful during a few short months of pregnancy. It is useful in helping to relieve common pregnancy discomforts such as sciatica, heartburn, lower back pain, and hip discomfort. Because it is a “C” shape and flexible, you can bend it to fit the size of your body. And because it’s an average size and not exceptionally long, if you’re shorter it won’t overwhelm your body. Because of the design of this pillow, it can eliminate the need for additional pillows that can take up room in your bed including a head pillow, a pillow between your knees, and other supportive pillows. It is not as big and bulky as some other options, and can help make sure there is still room in your bed for your husband. This pillow also comes with a satisfaction guarantee. If you’re not happy, contact the company within the first 30 days for a full refund. It comes with a satisfaction guarantee. The removable cover is machine washable. You can use it long-term when you’re not pregnant. It is not ideal for taller women. It does not offer support to both front and back simultaneously. If you’re a stomach sleeper, you’re going to need some serious help to keep it up throughout your pregnancy -- it’s nearly impossible. Thanks to innovators, though, you can slumber comfortably once again with an inflatable pregnancy pillow designed for stomach sleepers. Just make sure you choose one that also provides back and leg support -- not just a flat design with a hole in the middle. 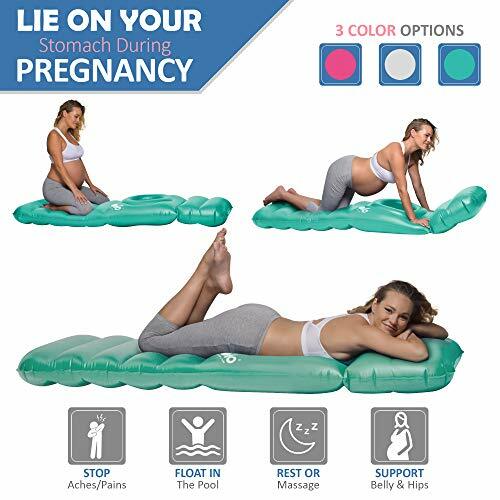 This inflatable air mattress comes in three fun colors and has an ingenious hole in the middle to accommodate your growing belly. Not only can it help you sleep, but it’s also easily portable — under three pounds — so you can take it with you anywhere. If you’re headed out of town, getting a prenatal massage, or planning a trip to the pool, this maternity pillow will travel with you. It’s even engineered for water use so you can get in on all the sunbathing action. 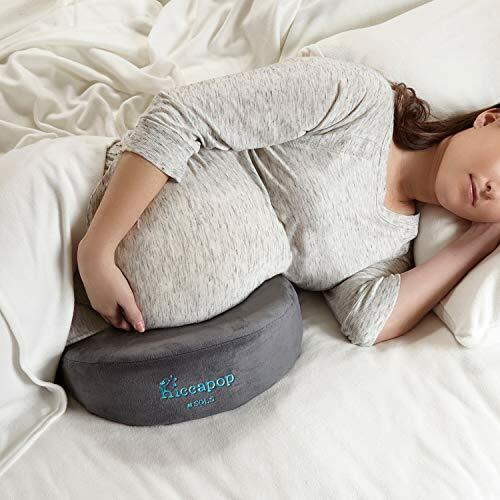 This pillow can help to alleviate some of the common pregnancy discomforts, including round ligament pain, heartburn, rib discomfort, and lower back pain. It may even help your baby get into proper birthing position. Because this product is inflatable and does not come with a pump, you will need to supply one on your own. It also should not be used on top of your regular air mattress and does not provide the same level of support as a regular mattress provides. It can also be prone to leaks if damaged. Because it is made out of material like a regular pool float, it may stick on your skin so using additional bedding is advised. And since it’s not adjustable, it may not be the best solution for tall women — or you may have to prop your feet up with pillows if they hang off the end. It can help you sleep on your stomach safely. It doubles as a pool float. It comes in several colors. It may not work for tall women. You still need a separate pillow and bedding. It can be hard to entertain the idea of buying a pillow marketed strictly for pregnancy. After all, it may seem a bit unnecessary since its usage window is so small. You may be wondering if you could just use a regular pillow instead. The short answer is yes — it is possible to achieve a similar result by using a collection of regular pillows. However, the convenience and engineering alone are worth the investment in a pregnancy-specific pillow. Instead of having to reposition several pillows every night, one product will allow you to slide into bed at the end of the day without much fuss. And since they’re engineered for pregnancy, they already have the necessary support built in exactly where you need it. If the expense concerns you, consider the fact you will use it throughout not only this pregnancy but any other pregnancies as well. Plus, you can use it during the postpartum period and, when you’re done with it, may be able to recoup some of the costs by selling or consigning it. It Reduces Pressure on Your Hips, Lower Back, and Pelvis: If you struggle with hip, lower back, or pelvic pain, you can prop a pregnancy pillow between your knees to keep your hips parallel, preventing the top one from being hyperextended downward and pulling the rest of your lower torso out of alignment. It Can Help Relieve Heartburn: Elevating your upper body with the help of a pregnancy pillow may help tame your heartburn, since it’s not as easy for stomach acids to flow back into the esophagus. It Can Prop Up Your Belly: Your muscles along the side of your torso can be stretched simply by the weight of your belly pulling them down. This also contributes to lower back pain. Placing a pregnancy pillow underneath your bump can help keep it elevated and in a position that will reduce the stress on your torso and lower back. It May Allow You to Sleep on Your Stomach: If you’re a die-hard stomach sleeper and desperate to continue through your pregnancy, some pregnancy pillows can help you do just that. It May Help You Breathe Easier: If like many women, you find your shortness of breath intensifies at night, a pregnancy pillow can help you to position yourself in a way that feels comfortable. Most women find relief by propping up their upper body, but the position you find most comfortable may vary. It Is Easier to Get Comfortable: Pregnancy pillows are designed with your pregnant body in mind. While you may be able to use four or five pillows propped throughout your bed to offer you proper support, they’ll need to be re-adjusted every night. And they aren’t as easy to move in the middle of the night if you need to. A pregnancy pillow is easy to adjust and can offer you support in just the right places, so you can focus on getting to sleep, not adjusting all of your pillows. It Can Keep You From Disturbing Your Partner: Yes, you’re the one doing the “heavy lifting,” and it’s not the end of the world if they’re a little inconvenienced every once in a while. But all your tossing and turning can start to wear on your partner, and if a side benefit of you resting better means that they rest better, too? That’s definitely a plus. There is no right time to use a pregnancy pillow other than whenever you feel uncomfortable and your sleep begins to be affected. Most women generally find that by their third trimester, the quality of their sleep begins to decline and a pregnancy pillow is helpful. It’s generally recommended you sleep exclusively on your side after 20 weeks of pregnancy, so if this is a new position for you, it might be the right time for you to begin using a pregnancy pillow to make sure you are comfortable. And some women might choose to use it the minute they discover they’re pregnant simply because it makes them feel good. I used a pillow toward the end of my first pregnancy, and when I discovered I was expecting my second, I took it out of storage almost immediately. After all, pregnancy pillows are comfortable! While generally safe, there are a few things to be aware of when using a pregnancy pillow. Do not use your pillow as an infant positioner: The shape of your pillow may give you the idea it could be useful once the baby is born as an infant sleep positioner, or even a co-sleeper in your bed. However, these pillows pose a serious suffocation risk to your baby. Babies should never be placed in a space that has soft materials and infant sleep positioners are not recommended by the American Academy of Pediatrics (AAP) at all (source). Do not prop yourself up on your back: When you sleep on your back, your uterus puts pressure on the vena cava, a major blood vessel. You could wake up dizzy, lightheaded, and in pain. Blood flow to your uterus may also be restricted. While you’ll likely wake up far before your baby is in any danger due to the discomfort you feel, never use your pillows to position yourself on your back intentionally. Use inflatable pregnancy pillows on the floor: If you are a stomach sleeper and use an inflatable pillow, don’t try to put in on top of your bed. Place it on the floor, as it could pose a falling risk if you try to sleep on it atop your bed. Using a pillow may seem self-explanatory, but it isn’t. Here are some of the most commons questions women have about pregnancy pillows. Can I Wash My Pregnancy Pillow? Specific washing instructions for pregnancy pillows will vary by manufacturer, but generally, the answer is yes. Usually, you can find washing instructions on a tag attached to your pillow. If you can’t find specific instructions for your pillow, a safe method is to wash on your machine’s gentle setting on cold and either air dry or tumble dry on low. Make sure your pillow can move freely in both the washer and the dryer — for some of the bulkier pillows, you may have to go to a laundromat and use an industrial-sized machine. Do Pregnancy Pillows Help with Heartburn? A pregnancy pillow may help with heartburn by allowing you to prop up your torso to keep stomach acids out of the esophagus. While any pregnancy pillow may be used in this manner, a wedge is most conducive to helping with heartburn. Can a Baby Sleep on a Pregnancy Pillow? A pregnancy pillow should never be used as a baby sleep positioner. A baby should be put to sleep on their back in a flat, firm crib or bassinet with no blankets, pillows, or soft surfaces. Do not let your baby sleep on your pregnancy pillow. Will It Prevent Me From Rolling Onto My Back? Yes, a pregnancy pillow can help prevent you from rolling onto your back. You can place a wedge pillow under your lower back, or opt for a full-body pillow that runs along the back side of your body. Can I Buy a Used Pregnancy Pillow? It’s perfectly safe to buy a used pregnancy pillow — make sure to wash it in hot water before your first use. Bedding can carry bugs such as dust mites, lice, and bed bugs. While this seems scary, a run through the hot cycle of your washing machine will kill them all (source). Body Pillows Vs. Wedges: Which Are Better? Wedges and body pillows have different pros and cons, so your particular pregnancy ailments will dictate which would be more useful. A wedge doesn’t take up nearly as much room and is much cheaper, while propping up your belly or helping to relieve hip pain. A body pillow can offer the same support, but also while cradling your head and neck. However, it can cause you to overheat. Why Does My Pregnancy Pillow Hurt My Neck? If your neck is sore after using your pregnancy pillow, it may either be too thick or not offering enough support. Your neck and spine should be in alignment — if it’s too high or too low, it could cause neck and shoulder pain. You may need to either add more support, or get a pillow that is not as thick. Should My Pillow Be Organic? It is entirely up to you whether you opt for an organic pregnancy pillow or not. Organic pillows tend to be more hypoallergenic as they have not come into contact with harsh chemicals. They are also better on the environment, thanks to more sustainable farming practices. If you tend to have sensitivities or are concerned about environmental impacts, then opt for organic. Should My Pillow Be Made From Memory Foam? Memory foam is a great pillow filler, but it’s often shredded for use in pregnancy pillows as it tends to hold heat in its solid form and pregnant women already struggle with being too warm. There are other fillers to choose from — it’s not necessary to only look for a pillow based on its filler. Make sure to consider other features, too. Can I Use My Pregnancy Pillow for Breastfeeding? You can use a body or flexible pregnancy pillow for breastfeeding support just as you would a nursing or regular pillow. However, a wedge pregnancy pillow is not the ideal shape to use for nursing. C- and U-shaped pillows could function perfectly fine for nursing at home, but keep in mind they are bulky and not easily portable for travel. Our top pregnancy pillow pick is the Coop Memory Foam Body Pillow. It is made of ultra-supportive memory foam, so it will maintain its firmness and support, but it’s also shredded and has added cooling technology to prevent you from overheating. It offers full-body support to keep your spine in alignment and relieve common pregnancy discomfort, but is not exceptionally bulky in your bed since it is just a straight pillow. You may even find yourself continuing to use it post-pregnancy since it’s so comfortable. Did you use a pregnancy pillow when you were pregnant? Give us your top tips to sleep comfortably while pregnant, and share this with a friend who is expecting. She’s going to be lacking enough sleep post-baby — she doesn’t need to miss out on it now, too.